This week, the Tuesdays with Dorie bakers made Dressy Chocolate Loaf Cake, selected by Amy Ruth of Amy Ruth Bakes. 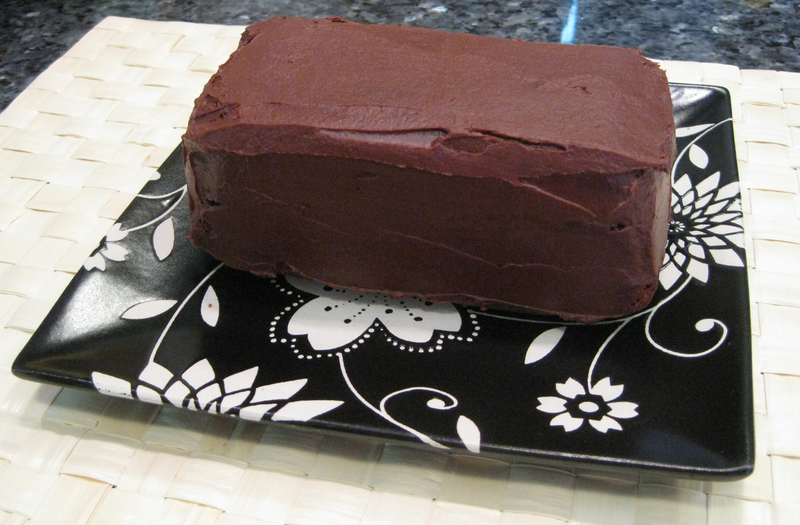 What makes this chocolate loaf cake dressy? Well, this three-layer dense chocolate cake is spread with raspberry jam, and the cake is frosted with a mixture of semisweet chocolate and sour cream. That’s kind of dressy, don’t you think? What I did: I made the full recipe with no changes to the ingredients. I baked it in three mini-loaf pans instead of one large pan. It worked out great, because I kept one cake for us and gave the other two away. How it went: This was an easy cake to make. The texture is pretty dense, so it was also an easy cake to slice into three layers – a major bonus, because I’m not the best cake-layer-slicer. How it tasted: My husband and I were not in agreement on this one. I liked the texture of the cake, the chocolate flavor with the bit of raspberry, and I really liked the frosting. The bottom line for my husband was that it wasn’t sweet enough. He liked the texture of the cake but wasn’t digging the frosting’s taste or texture. It was still in the “I’d eat this” category, but definitely not a favorite for him. Being such a sweet guy, I think he requires large amounts of sugar! My dad did not like this cake, but my neighbor did, so it gets a 50% success rate. If this sounds like it’s up your alley, Amy Ruth will have the recipe posted today, or look on page 286 of Baking: From My Home to Yours. 50% is better than nothing! It looks so nice- love that plate. Oh, I love the idea of the mini, so happy to hear that works well. Guys loved it here…definitely a repeat. Yours looks so elegant. I really loved this cake-but I made the frosting differently than what the recipe called for. Your cake-and the platter it is on-look amazingly good! We loved this! It doesn’t look like a mini…. he he he. Nicely done and the plate is awesome. Glad at least you liked it. Thank you for baking along with me this week. I can’t believe that’s not a full-size cake. Funny what you can do with a camera. This actually wasn’t my favorite either. Couldn’t really put my finger on it but maybe your husband did. Perhaps not sweet enough. I love less-sweet cakes so I think that this sounds really delicious. Your frosting looks so pretty and I love your presentation. Fancy!! I adored this cake – so this brings up the sucess rate, doesn’t it?? Your b&w plate is just lovely. With no point of reference your cake looks full-sized. Interesting that you got mixed reviews. I’m with you and thought it was good. I actually liked it because it wasn’t overly sweet. I used a 72% chocolate which also cut the sweetness a bit. Nice job on the frosting, the mini cake looks perfect. It’s nice that your dad and your husband can be honest about your baked goods. I served this on Father’s Day and everyone seemed to enjoy it.